Big news coming from LPUHQ today! 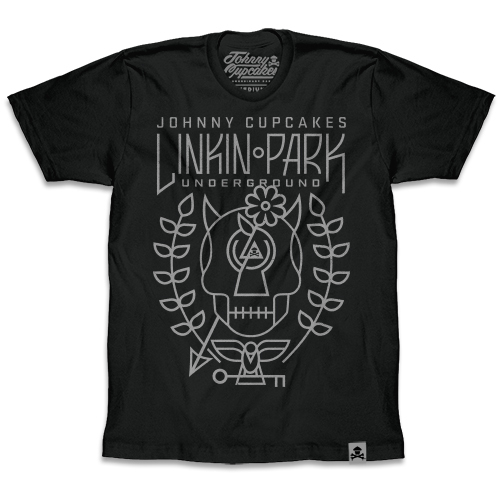 The Linkin Park Underground has partnered up with Johnny Cupcakes for a very special offer. The specially designed Johnny Cupcakes x LPU limited edition T-Shirt comes with a one year membership to the LPU. In case you have forgotten what a membership includes, try pre-sale ticket opportunities, chances to participate in the meet & greet lottery to meet Linkin Park at select shows and of course, access to the LPU online platform. If you think this offer is for you, you have to be quick: pre-sale is available now through November 17, 2014! Go to http://shop.johnnycupcakes.com to purchase and learn more about this exclusive collaboration. Don’t forget to tell us your opinion about the shirt’s design and how many you wanna buy in our forums below! At a young age, I stumbled upon Linkin Park’s cassette tape single at a record shop. Ever since then, I have been a huge supporter of these guys. It has been inspiring to watch them grow musically, while also witnessing the creation of such an influential brand in the music industry. When the opportunity arose to work with their fan club, Linkin Park Underground, we jumped at the chance. We love exploring exciting channels through which to engage our fans and hopefully open their eyes to new experiences, so it was a nice change of pace to provide that new opportunity for the LPU. Johnny Cupcakes doesn’t sell real cupcakes, their quirky apparel — largely focused on graphic tees that poke fun at pop culture with a culinary twist — still creates a buzz through word of mouth and general curiosity. Johnny Cupcakes creates a unique experience for each customer through special events, nationwide tours, unique packaging, playful retail environments and endless surprises, which over the past 12 years has amassed them an international following of die-hard collectors. November will be an eventful month for the LPU members. It will commemorate LPU’s 14th year with the release of LPU XIV, which will include a special edition album featuring unreleased LINKIN PARK demos. Visit http://LPUnderground.com for more details on how to become a member. Additionally, LINKIN PARK will begin their European run of ‘The Hunting Party Tour’ on November 3rd in Zurich, Switzerland. You can find all the tour dates HERE! Join the LPFC Team: News Posters Wanted! This entry was posted in Blog, LP Underground, LPU News, News and tag Johnny Cupcakes, linkin park, lpu.